Its crisp, clean design includes an inside document pocket, business card pocket, pen loop, and room for an 8 1/2" x 11" letter size writing pad which is included. Keep your everyday business essentials neatly organized in the Elements Slim Briefcase. This business case's modern, practical design has plenty of space for your files and folders, a padded compartment that can hold up to a 15.6" screen laptop, and organizer pockets for your wallet, phone, pens, and accessories. The center compartment is padded to protect laptops with up to a 15.6" screen. 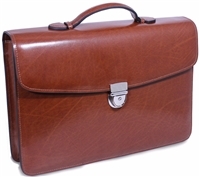 Keep your back and shoulders at ease when traveling or commuting with this hand made European leather business wheeler. Looking for a special Jack Georges Elements Bag? Please don't hesitate to contact us with any questions.